Probashbangla24 online Desk : A rescue team Sunday began retrieving the bodies of nine climbers killed in a violent storm on Nepal’s Mount Gurja, a freak accident that has left the mountaineering community reeling. A helicopter dropped four mountain guides at the camp where the South Korean climbing expedition was staying when powerful winds and snow swept through, killing the entire team and scattering their bodies as far as 500 metre (1,640 foot) away. Mountaineering experts are questioning how the experienced team was so badly hit while still at base camp at around 3,500 metres. 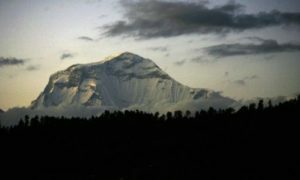 The team — five South Koreans and four Nepali guides — had been on 7,193- metre (23,599-foot) Mount Gurja since early October, hoping to scale the rarely climbed mountain via a new route.